Hydraulic Control Valves for Forklift - The function of directional control valves is to be able to direct the fluid to the desired actuator. Generally, these control valves include a spool situated in a housing created either from cast iron or steel. The spool slides to different positions inside the housing. Intersecting channels and grooves direct the fluid based on the spool's position. The spool is centrally located, help in place by springs. In this particular position, the supply fluid can be blocked and returned to the tank. When the spool is slid to a side, the hydraulic fluid is directed to an actuator and provides a return path from the actuator to tank. When the spool is transferred to the opposite direction, the return and supply paths are switched. When the spool is allowed to return to the neutral or center place, the actuator fluid paths become blocked, locking it into position. The directional control is normally made to be stackable. They generally have one valve for each hydraulic cylinder and one fluid input which supplies all the valves in the stack. Tolerances are maintained extremely tightly, in order to handle the higher pressures and to avoid leaking. The spools will usually have a clearance inside the housing no less than 25 Ã‚Âµm or a thousandth of an inch. In order to prevent jamming the valve's extremely sensitive components and distorting the valve, the valve block would be mounted to the machine' frame by a 3-point pattern. Solenoids, a hydraulic pilot pressure or mechanical levers can actuate or push the spool right or left. A seal allows a portion of the spool to stick out the housing where it is accessible to the actuator. The main valve block controls the stack of directional control valves by flow performance and capacity. Some of these valves are designed to be proportional, like a valve position to the proportional flow rate, whereas some valves are designed to be on-off. 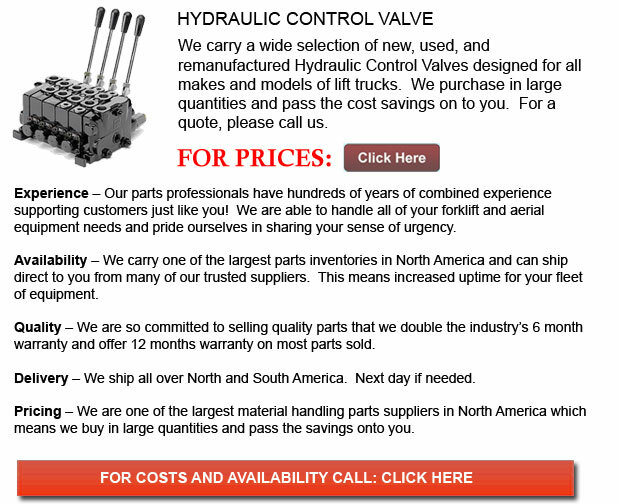 The control valve is amongst the most sensitive and expensive components of a hydraulic circuit.